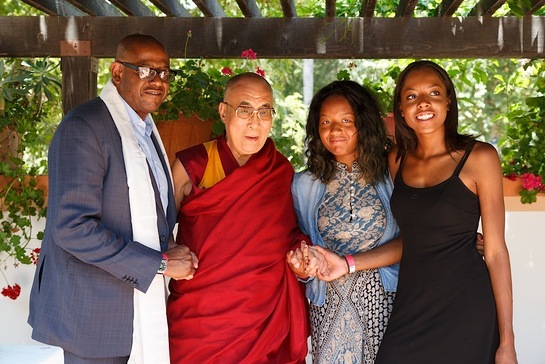 The Peak Mind Foundation hosted His Holiness the 14th Dalai Lama for an event on July 4 celebrating his 80th birthday and a lifetime devoted to spreading the message of the value of peace, kindness and universal compassion throughout the world. The Peak Mind Summit event was a celebration of a lifetime devoted to spreading the message of the value of peace, kindness and universal compassion throughout the world. Other attendees included: Michelle Phan, Kelly Slater, Keith Mitchell, Chris Cornell, Linda Perry, Sara Gilbert, Tim Fain, Lewis Howes, Joy Williams, Jesse Carmichael (Maroon 5) and more. “We are honored to host His Holiness the Dalai Lama at this crucial moment in history. With domestic and global challenges calling for newfound cooperation, we look for inspiration from His Holiness the Dalai Lama as a tireless advocate for compassionate action for our shared humanity,” Michael Trainer, Founder of the Peak Mind Foundation said of hosting the event. The event, co-created by Michael Trainer, Andrea Fennewald, and Kalden Lodoe took place at Rancho Los Lomas in Irvine, California on Saturday, July 4th while also livestreaming around the world at www.dalailama.com. Peak Mind Foundation creates events, experiences, and educational & inspirational content to inspire our highest possibility. The first focus of the foundation will be on meditation in schools and providing the tools for youth to create impact in the world from the inside out. Founder Michael Trainer began this work nearly 20 years ago as a Fulbright Scholar in Sri Lanka. He’s built a reputation as a leading social entrepreneur, and his focus has consistently hinged on building movements with global impact, most recently as co-creator of Global Citizen and the Global Citizen Festival. Find out more here.